The constant hustling and bustling in the oceans create unceasing unimaginable noise. the sounds from boats’ propellers and hulls as well as other recreational activities such as jet-ski, water skiing, sport fishing, ...contribute to this cacophony. The no-appropriately-named “silent world” has become an unbearable cacophony for its inhabitants due to ever-increasing human activities. According to researchers at the Monterey Bay Aquarium Research Institute, USA, the increasing acidity of ocean may let the marine environment becoming even more noisy. Changes in the chemical composition of seawater would diminish the capacity to absorb low frequency sounds by 10% compared with the pre-industrial revolution era. Unless we reduce greenhouse gas emissions by 2050 (a path we are not following...), the acidity of the oceans and seas could reach a level such that the noise of ships and airguns used for offshore exploration would travel 70% farther than at present time. No comment...or NO FUTURE ? Whales produce sounds (clicks, whistles, vocalizations), most of which are characteristic of a species or a population by their shape, frequency and duration. They use echolocation systems similar to active sonar, sometimes over long distances to locate their peers, their prey and their predators. 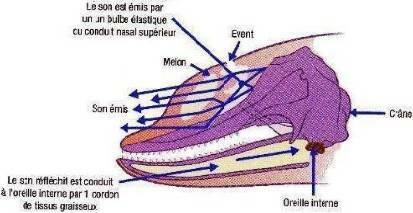 Cetacean capture sound waves with their lower jaw, lined with highly vascularized adipose tissue. This serves as a resonance structure for echolocation. The vibrations are so strong that some balls of adipose tissue come off the jaw, and are found in the blood of animals at autopsy. The increasing noise of oceans and marine environment disorients them, disperses and threatens their livelihood, and may lead them to extinction. 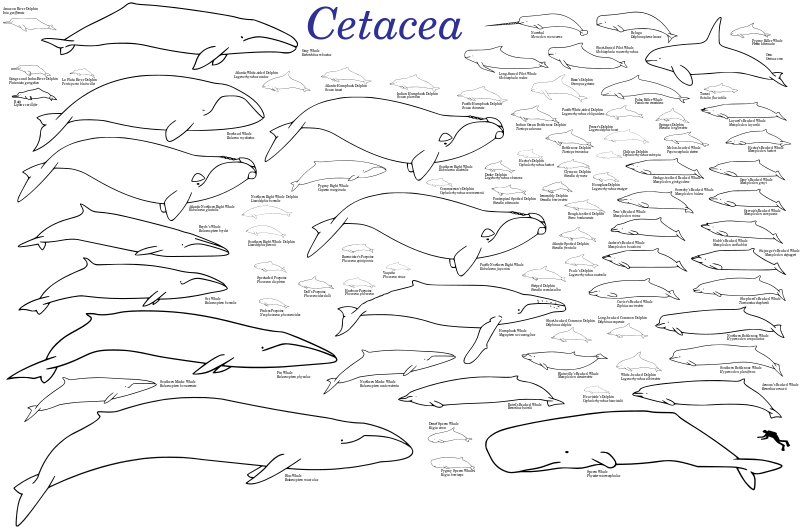 During their dive, as far as we actually know, most cetaceans experience space only through acoustic signals they receive and issue. For them, hearing is the most important sense. Their capacity to hear well is vital in all key aspects of their lives, such as finding food, travelling and socialising. Do you know that the auditory nerve of the dolphin is 10 times longer than the man’s one? To breathe, they take their time, naturally respecting decompression “levels”. But under stress generated by colliding sonar waves, stress hormones are spread throughout the body, the heart rate increases and the leak is obvious: whales undertake an emergency ascent. As with divers, a too fast ascent causes an accumulation of gas in the organs. To understand a little better what these animals are suffering, imagine a comparable scenario: you are in the street and suddenly you hear a noise that makes you lose your sense of direction. The sonar’s intensity is stronger than a jet’s take-off. And it lasts several hours and not only a few minutes. You can feel your bones and flesh in your body vibrate because of the noise; your ears start bleeding. The noise generated by the sonar saturates the oceans on hundreds of miles creating acoustic barriers that are insurmountable for cetaceans. That means you cannot escape...Here come place for emotional distress and physical pain, and death. The sound of military sonar therefore generates decompression problems for cetaceans, that are very often followed by a stranding. We know a little more about this phenomenon today thanks to the autopsy of bodies of stranded animals found dead. Scientists discovered that the liver was full of gas bubbles (sometimes the size of a tennis ball), the kidneys ruined and fat particles were found in the blood (conductive fat tissus detached from the jaw). Animals die a slow death. Some of them lose their strength on the shores. Maybe they approach the land as a way to reach safety? 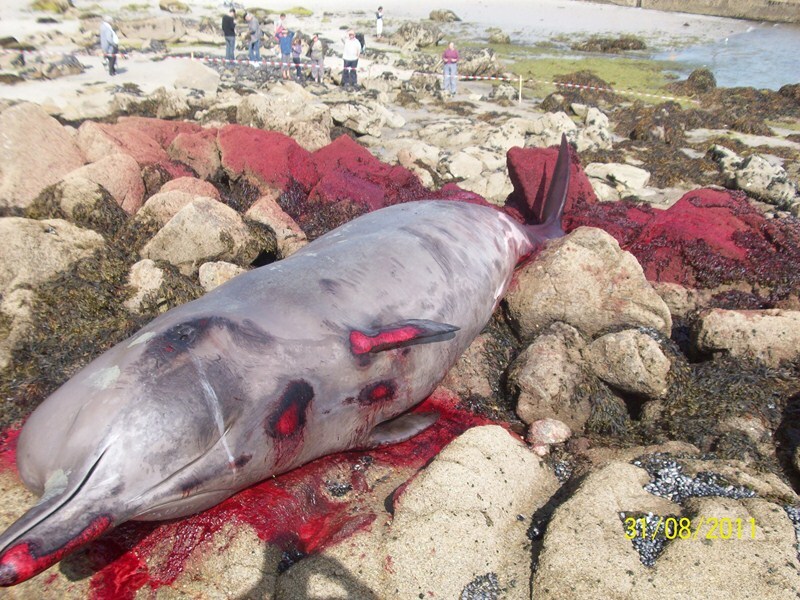 The stranding phenomenon is not recent: the first cetacean stranding was recorded in 1805. Since then around twenty strandings per year have been recorded until the 1960s. But the conclusion is obvious: since the 1960s, there is a sharp increase in cetaceans’ strandings. Of course information flows more easily since the mid-20th century, but is it simply because it is easier to know what is happening on the other side of the Earth, or is it because there are more and more accidents? 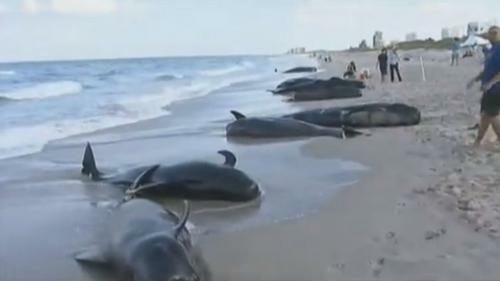 In 2000, in the Bahamas, a U.S. Navy experiment with a transmitter up to 230 dB in the frequency range of 3,000 to 7,000 Hz caused the beaching of sixteen whales, seven of whom were found dead. Two years later, the U.S. Navy finally recognized its responsibility in this stranding in a report published on 01/01/2002 in the Boston Globe. Beached whales near St. Andrews, Scotland, Sept. 2, 2012. During the same weekend of 09/02/12, dozens of pilot whales were stranded on both sides of the Atlantic, the coast of Scotland and Florida. In North America, it was the third such incident in two days. 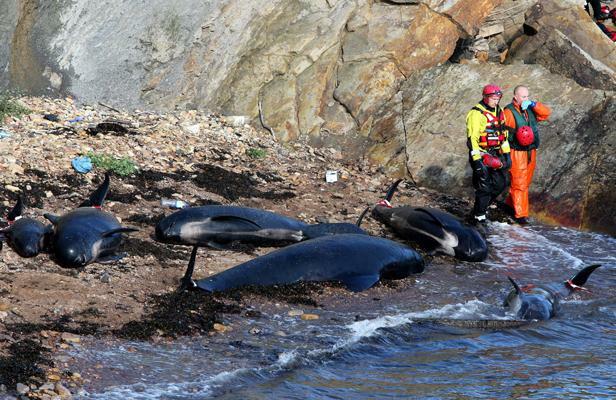 On 02/09/12, a large group of 26 pilot whales (Globicephala macrorhynchus) were beached on the eastern coast of Scotland, near St. Andrews. Sixteen died, but rescuers managed to get the other ten back into the water. Two other groups of pilot whales were beached at Cape Cod, Massachusetts (North-eastern United States) on 09/01/12, and Canada 09/02/12. It is believed that the seismic survey performed by the company M / V Polarcus Adira could be responsible for these beachings. 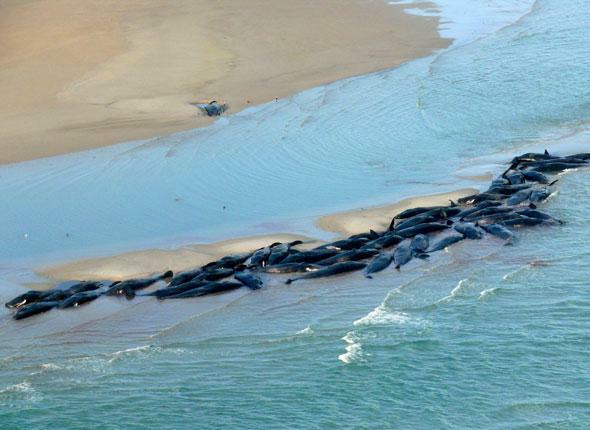 Two other groups of pilot whales were beached at Cape Cod, Massachusetts (North-eastern United States) on 09/01/12, and Canada 09/02/12. On 09/01/12, 22 whales - only 5 were saved - were stranded on a Florida beach. 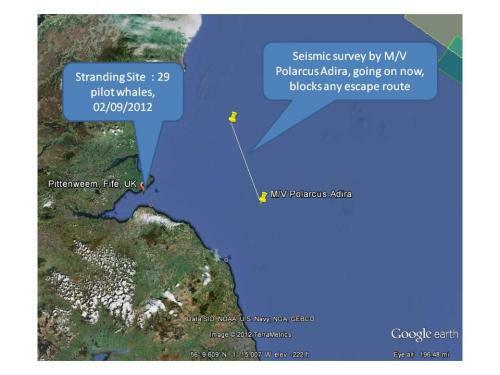 The reason for these early September 2012’ strandings is still yet to be determined. Communication: the destruction of their echolocation system creates problems within the clan. Both males and females can no longer join. Education: the young have difficulties to learn the group codes and more often, they end up lost and stranded on beaches. Migration: forced to deviate from their normal routes, individuals of the same group eventually split up. 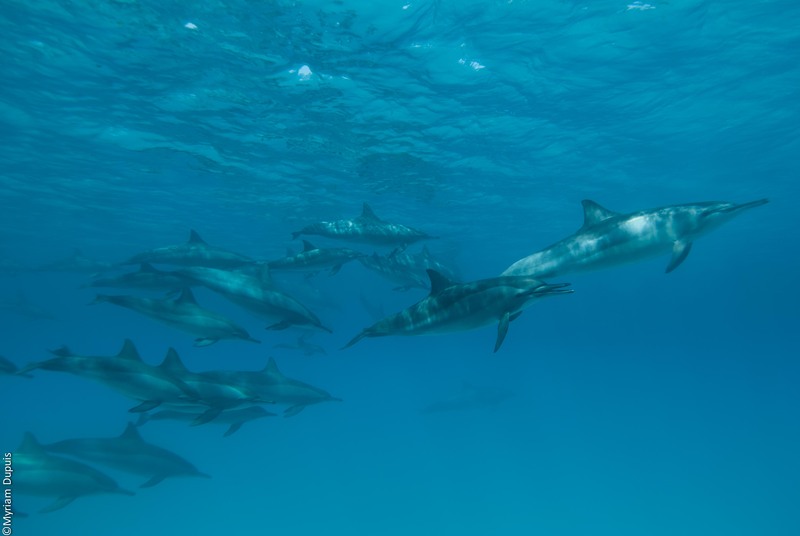 The researchers found stranded cetaceans in places not usually frequented by these animals. The risk of famine: cetaceans are not able to locate their prey and thus feed. Change the sonar frequency BUT this is not a solution because other cetaceans’ species will be affected since each cetacean species has different characteristics of resonance clean. The shipping industry has the manufacturing capacity of building « silent » vessels but it is expensive. And as to date, no national or international obligation has been set. Despite the recommendations made by scientists and associations for several years, nobody wants to pay. Create more areas where maritime traffic, military manoeuvres, offshore exploration, aquatic recreational activities are totally prohibited, as well as corridors to connect these quiet areas. Join associations that are fighting for these issues ... and talk about it around you and relay info via your networks to members of Parliament: we are public opinion and we can act.